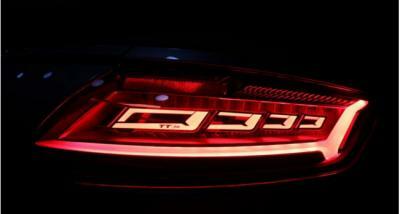 Audi has yet to unveil the 2016 Audi TT RS coupe, but according to new reports the car will use OLED taillights. The Audi TT RS is a high-end car but is serially produced. In fact, if this report is true, the 2016 TT RS will be the first serial-produced car with OLED lighting. In September 2015 BMW announced that they are starting to produce the M4 GTS at very limited quantities - and this car has OLED lighting too. But only 700 such cars will be produced. Audi has been playing with OLED technologies for a long time. Back in 2012 they unveiled three OLED lighting designs, and in 2013 they unveiled 3D OLED lighting Audi TT taillight prototypes (developed with Philips and Merck). Several of the company's latest concept cars, such as the 2014 Prologue and the 2015 e-tron Quattro adopted OLED displays and lighting technologies.